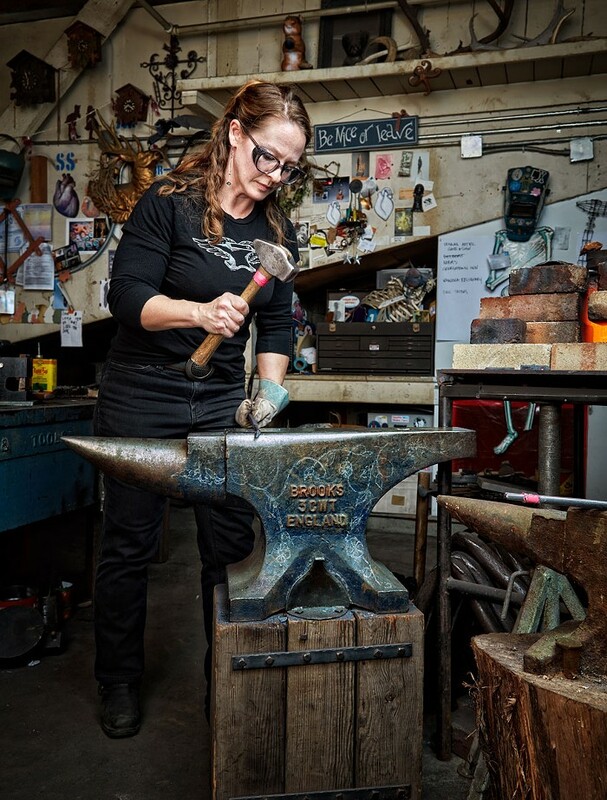 Seattle blacksmith Lisa Geertsen has been shaping metal since 1999, the seeds of her interest planted while taking a sculpture class in college. Now she has a studio, Firelight Forge (located in Equinox Studios), and 2017 marks her 10-year anniversary. She does all custom commissions, mostly architectural or functional fabrications—furniture, railings, lighting, gates. But occasionally, she says, "I get clients who are looking for something special, and that's when I get to have fun." She also works at Pratt Fine Arts Center, where she's a blacksmithing instructor as well as the metal and stone sculpture studio manager, her duties ranging from scheduling classes to designing programming to repping Pratt at community events like this September's Seattle Mini Maker Faire. She also creates art pieces (a new sculpture will be featured in a group show at Pratt next month), and she opens her doors once a year during Equinox's Very Open House in December. "If you have never been to this event, put it on your calendar—it's the best holiday sale/party in Seattle. I always say it will knock your socks off and light them on fire... no, really." What are your metals of choice? I mainly work with steel, especially for commissions. It's less expensive and more forgiving to work with. I also work with all the metals I can get my hands on. I haven't tried everything yet, but as many nonferrous metals as I can. I love working with copper and bronze, both are lovely to forge. Aluminum is fun too, but very finicky. Stainless is more fun to weld than forge, and brass is challenging but beautiful. Titanium, though, that one intimidates me a bit, but that's why I keep going back to it. I know a blacksmith, David Browne, whose tagline is "Fire is a tool." So I have to say fire is my favorite tool, because without the fire, the metal won't get hot. Well, not as fast. There's friction and all, but that takes too long. Two restaurant sculptural installations. One is no longer there, I removed it and the owner has the art piece. But it was a 24-foot-long copper night sky scene with clouds, birds, a tree and the taps for the beer lines were concealed by a sculpture of the Smith Tower. The other restaurant is in Kirkland, Milagro Cantina. There is a 24-foot-long and 6-foot-high metal tree behind the bar. I still like that piece a lot; they have really good food, too. Also, last year, I made an outdoor railing for a client who has more than 80 species of rhododendron and camellia in his garden, so I clipped some of the rhody leaves and had them cut out of metal to incorporate into his railing. Since it's the Pacific Northwest, I also incorporated plenty of ferns. I love that my metal rhodys are right next to the plant I took the leaves from. Most recently, I finished the new gate for the bathhouse at the Panama Hotel. This was a long and drawn-out project, but we put a lot of effort into getting it just right and now the entryway to the bathhouse looks much nicer than the old chain-link gate. What tends to inspire you most? I'm most inspired by nature and other artists. I am so lucky to be surrounded by artists both at Pratt and Equinox, plus my large family of artist blacksmiths. Seeing what my peers and idols are making definitely gives me the urge to get into my studio and make my ideas realities. What are some challenges you face in your field? Loaded question asking a lady blacksmith that one! It's getting easier, but as you can imagine, I'm not [visually] what most folks expect when they are looking to have some metalwork made... meaning, I'm not a man. I've been in meetings where clients will ignore me and talk only to the man I may have with me, not knowing that I am the owner of the business. But I deal with it. I've learned how to be professional and kind, and when to walk away from a job. Mostly my biggest challenge is balancing my business and my job at Pratt. Both require a lot of my attention, and I'm not one to do things halfway. What’s the most fulfilling part of what you do? The most fulfilling part of what I do is a finished project that I am happy with AND that the client is happy with. As for the Pratt side of things, seeing my programs grow and reaching the community creatively is super rewarding. But I will tell you, there is nothing like the moment when the student who has been struggling for weeks finally "gets it" and successfully forges the nights lesson. That there is why I teach. Do you come into contact with many other women blacksmiths? I will answer this with a "oh, hell yes!" The women blacksmiths of the PNW are the very reason I am a blacksmith. The ladies out here are family to me and when I first met some of them I said to myself, "I want to grow up to be like her someday." 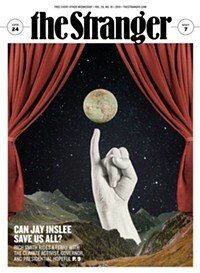 Ladies, I know you are reading this article, you know who you are, and you know I love all of you. We have quite a lot of badass lady blacksmiths around here and across the country. I have had the honor of meeting many of them and would love to meet more. There are even a couple of Facebook groups dedicated to women blacksmiths. Where's the best place to see unexpected metal art in Seattle? The Asian Art Museum. In the atrium, there are some Samuel Yellin gates. Blacksmiths know who he is, someone we all look up to; he was very prolific, but mostly on the East Coast. And his style is not what you would expect to see in that museum. Many of our master smiths have learned from him and have passed on his skills to many of us. What is your favorite restaurant in Seattle? What’s your go-to order? Now this is a tough one. Which neighborhood? Lunch or dinner? When I'm at Pratt—Szechuan Cuisine; pepper fish and pea vines. When I'm at my studio—Smarty Pants, turkey avocado no cheese, or Loretta's, tavern burger no cheese. Both lunch. If I've been working all day and need good food, I have two go-to spots for dinner... Loretta's again, tavern steak, either the platter or the salad, or Endolyne Joe's, something off of their seasonal menu is what I usually go for. Weekend Brunch—Smarty Pants Burien, corned beef hash with poached eggs and rye toast. Favorite bar? What’s your drink? Loretta's it feels like home. I switch it up. Winter, hot toddy. Summer, margarita, cider, or vodka soda. What’s been on your playlist lately? DJ Shadow. Beastie Boys. Jurassic 5. Sharon Jones. Louie Prima. New York Dolls. KEXP. What other local artist should everyone know about? Geez, I'm surrounded by artists that everyone should know about! This is as hard as the food question! I'm going to stick to blacksmiths and mention two. The Master Blacksmith that I trained with as well as many of the other local smiths, Darryl Nelson. He's out of Eatonville, but his work can be seen around Seattle, most recently at the new Filson store—check out the door handles next time you are there. And secondly a peer, Scott Szloch. He makes some of the most beautiful and creative forged sculptures I have ever seen, they have such graceful movement and impeccable craftsmanship. He's also a blacksmithing instructor at Pratt. Working in my shop, and having too many deadlines to know which way is up. But really, rainy and gloomy weather is kind of perfect for working at the forge.